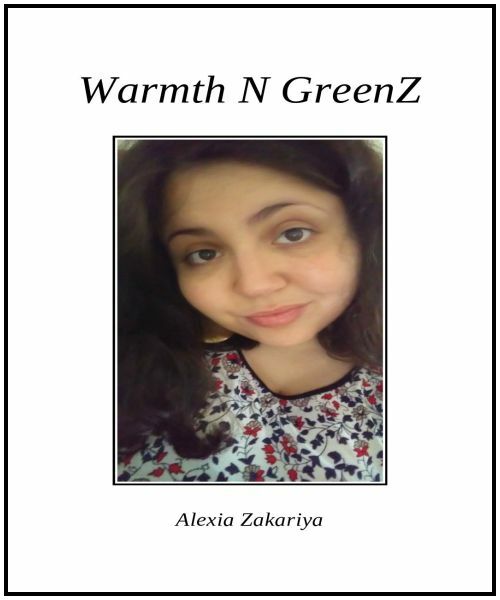 Warmth N’ GreenZ is a promising new Rap inspired work from emerging Poet Alexia Zakariya. Alexia Zakariya (Poet, wife, mother) attended Lehigh Valley Charter Arts School, Bethlehem, PA. She is constantly creating, singing, writing, drawing; steeping in the arts soup of great writers and songwriters. This poetry is magic, enigmatic, the Middle Eastern goddess as wife and mother. This poetry is influenced by rap music/poetry, is experiential and protest poetry, often in Black meme, the voice of the Poet is just forming as she is only 25 years old. This Writer experiences this Poet as a young Gwendolyn Brooks. The themes include protest poetry against war, racism, hard times and poverty and includes love of her husband, her son and God. The Poet harkens to the New American School with work that plays with syntax and uses symbols. The truncated thoughts are original with flashes of brilliance and often with ryhmes, rhyming couplets and rhyme at the end of lines, the hallmark of rap poetry. Within the work are some Haiku and longer pieces and a series of poems under 20 lines that gel exquisitely, they are like mainline rap, that bang in the dance and roll in liked tied packages. I Guess He Came –"
A truthtelling, the rock and roll of relationship, home life, a young adult's experiences with society all rolled into poetry. Looking for more work from this Poet. Middle Eastern girl magic, enigmatic, girl power and magic, Warmth N GreenZ by Alexia Zakariya.